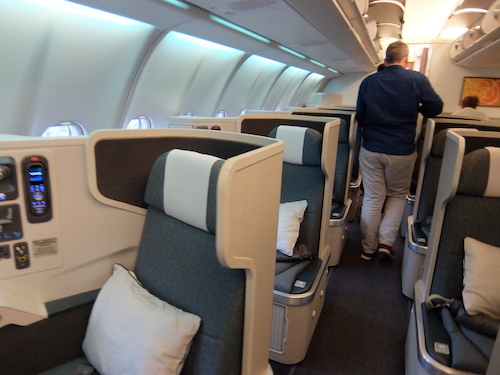 After flying to Hong Kong on Finnair, boarding the Cathay Pacific business class cabin felt remarkably similar, both cabins are laid out in the 1-2-1 reverse herringbone formation, and the seats have a similar structure, the Cathay fit out is older, although still high quality. 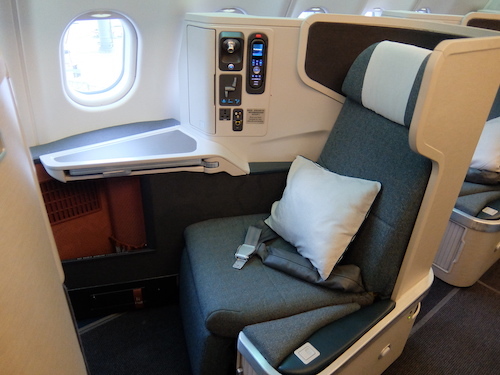 Cathay Pacific business class cabin. On this occasion we chose the window seats, with a bit of daylight left it was great to look out the window as we enjoyed our pre-departure champagne and settled into our seats. 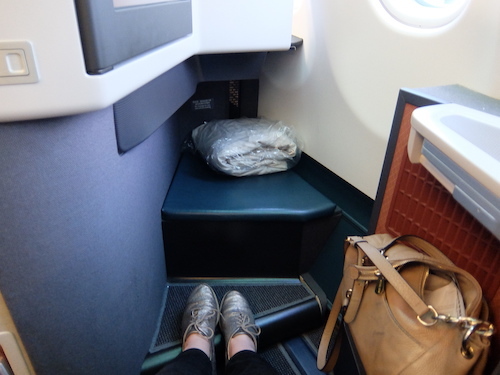 The Cathay Pacific business class seat feels very roomy, and with the reverse herringbone layout pointing you towards the window there’s plenty of privacy. I would recommend passengers travelling together who want to be able to chat to take the 2 middle seats, whilst still seperate and with privacy they are angled towards each other making it easy to lean forward and have a conversation. 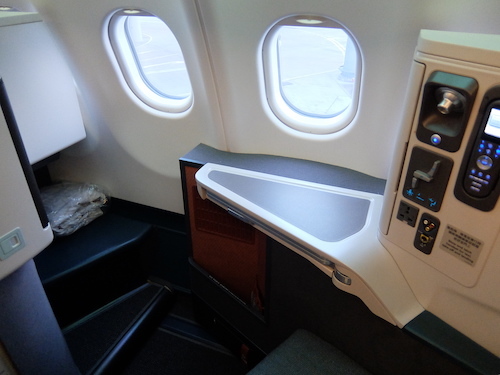 Cathay Pacific business class window seat. 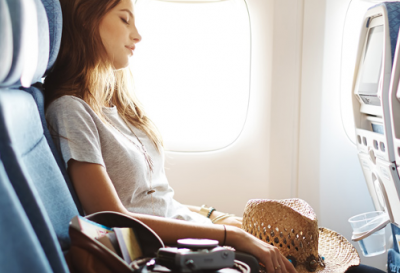 There is plenty of space within the seat area and the window seats feel light and airy. 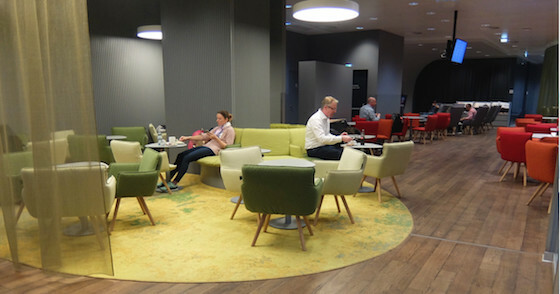 As with Finnair there is a fixed side table which is convenient for drinks/keeping your inflight essential belongings. A foldable dining table swings out from underneath the side table for meals, and a retracable arm rest on the outside of the seat can be lowered for additional room or raised for increased privacy. A convenient fixed side table is accompanied by a fold out dining table. The seat connects with the footrest at the touch of a button to convert into a bed more than 2 metres long constructed with super comfortable memory foam. The panel to the side of your seat contains all of your controls, power connections and a handy storage compartment for your headphones. 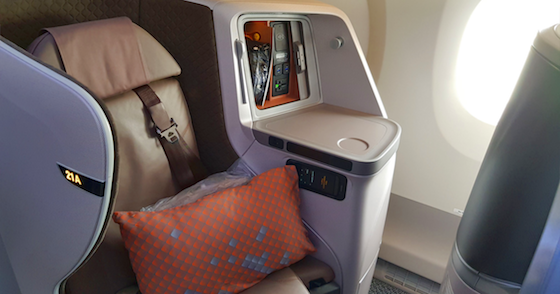 Conveniently this compartment has a door which can be secured closed, making a great little cubby hole for your phone etc during take off. 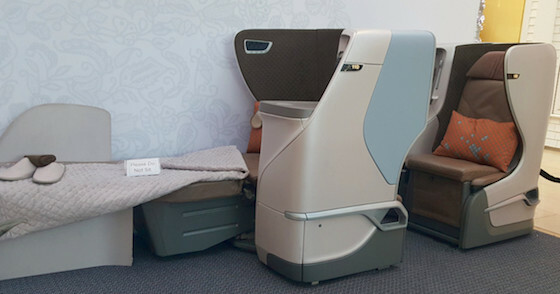 The seat controls include a flat bed button to convert your seat to a bed as well as various back rest, seat cushion, and leg rest adjustments providing customised seating options. 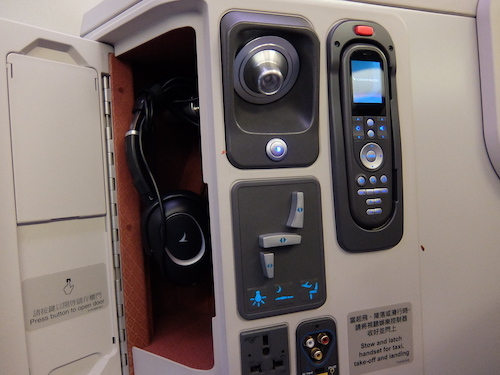 Seat and entertainment controls and a handy storage headphone compartment. 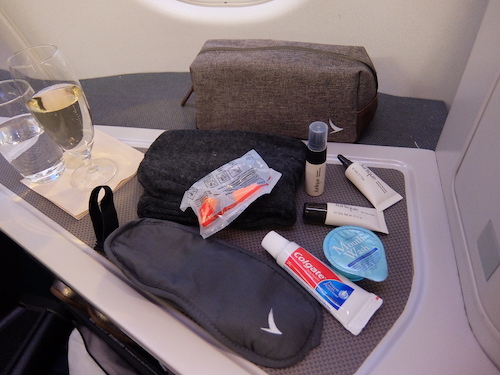 After settling into our seats, we were presented with our amenity kits. The bags were very neat and inside was a bevy of products including Jurlique skin care (I found the face mist particularly nice to keep hydrated during the flight), an eye mask, ear plugs and socks, plus a teeth cleaning kit with the addition of a small tup of mouth wash.
Cathay Pacific business class amenity kit. 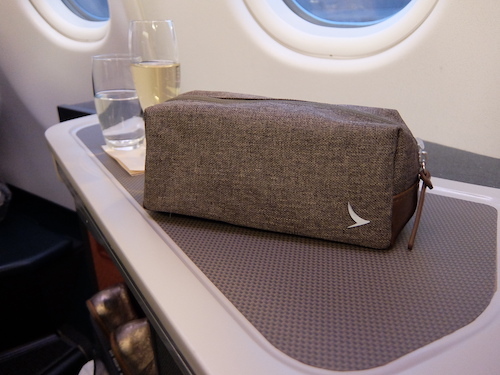 The Cathay Pacific amenity kit includes Jurlique products. 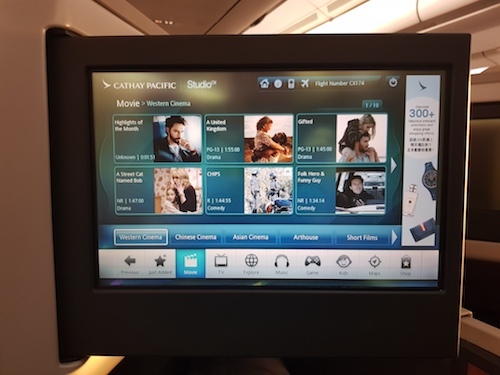 The inflight entertainment on Cathay Pacific was exceptional with a very wide range of current and classic movies, plus TV shows, plenty of music, and a selection of games to keep you occupied. 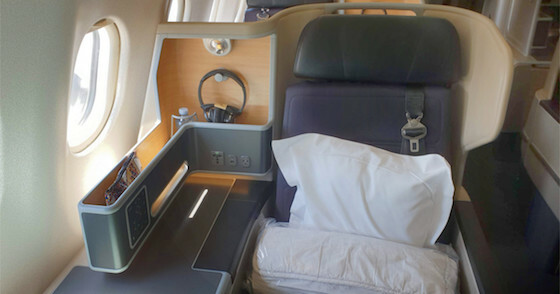 The large screen has very good clarity and is operated either via touch screen or by using the remote which is tucked into your control panel if you want to recline back. 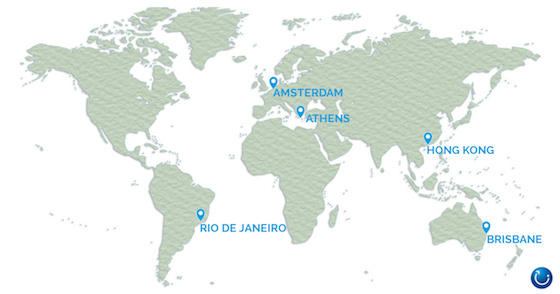 Cathay Pacific inflight entertainment includes a wide range of current movies. Boarding our flight from Hong Kong just after 6pm, we were treated to the full 4 course dinner service along with a comprehensive list of wine, beer, and spirits. 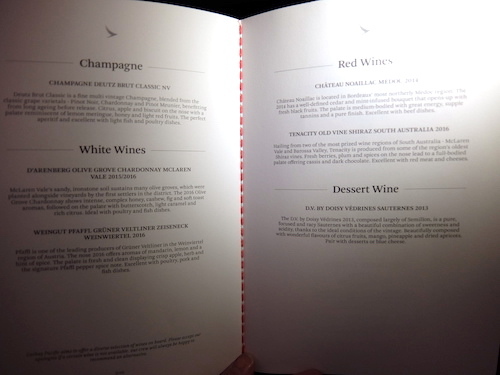 Cathay Pacific Business Class Dinner Menu. 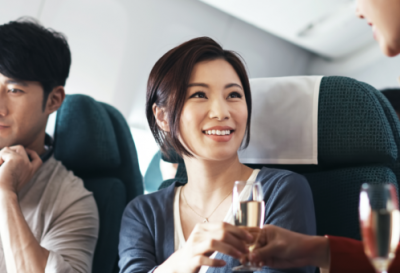 Cathay’s business class wine list includes wines from Australia and France. First course was a prosciutto served with fresh rocket, olives and bocconcini along with a green side salad. 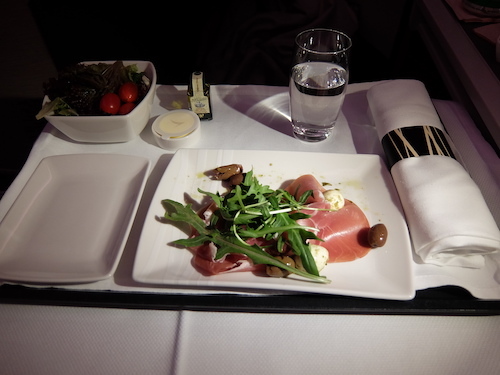 Cathay Pacific Business Class Dining: Course 1 Prosciutto Salad. Following the starter was a choice of steamed fish, braised beef cheeks, chicken curry, or vegetarian gnocchi. I chose the Chicken curry which was served along with steamed rice and Kailan, a type of Chinese broccoli. 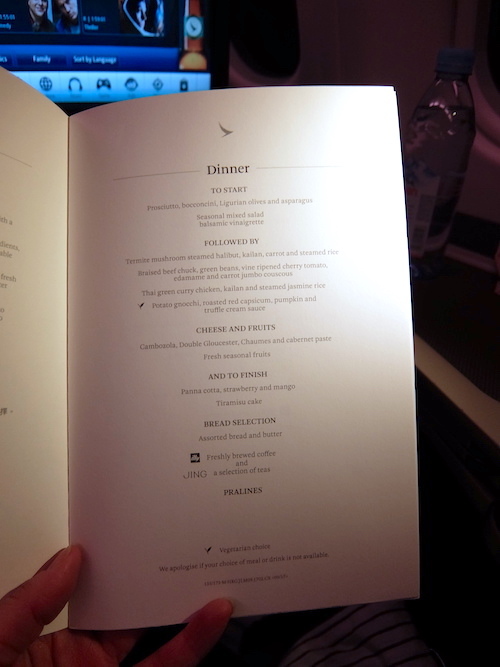 The curry was an absolute stand out, fresh and tasty and was one of the best inflight meals I have had in a long time. 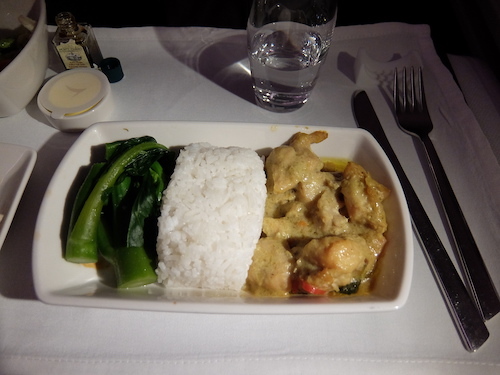 Cathay Pacific Business Class Dining: Course 2 Chicken Curry. 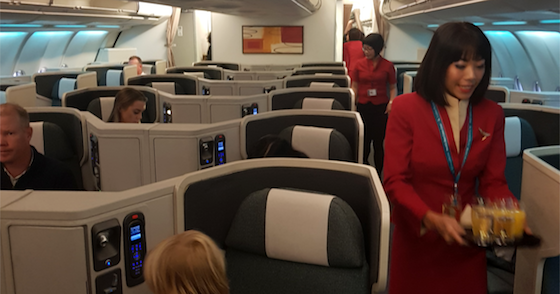 The service from the flight attendants onboard cathay was exceptional, with staff very quick to remove empty plates and refresh empty glasses. Following the main course the flight attendants came through with a cart and offered me a selection of cheese or fresh fruit. After already enjoying the spoils of The Pier lounge, and the previous 2 courses onboard, I opted for a selection of fruit which was delicious and the perfect end to the meal. 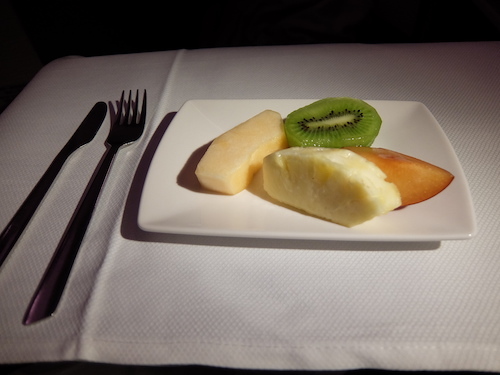 Cathay Pacific Business Class Dining: Course 3 Fresh Fruit. A second cart was brought around with a selection of delightful looking cakes, but unfortunately I couldn’t fit another bite. 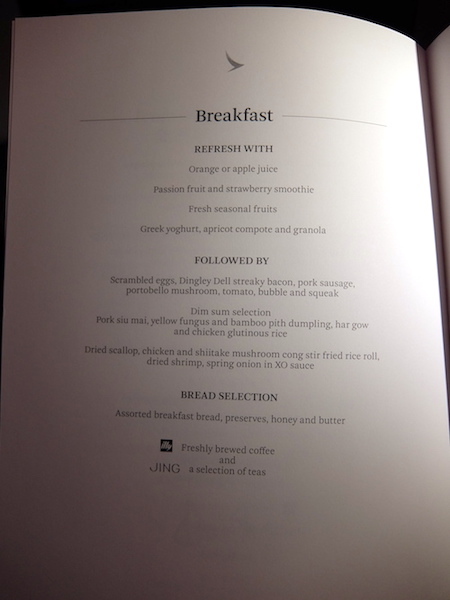 The following morning breakfast was served, starting with a juice or a smoothie, granola, fresh fruit, a choice of Western or Asian hot breakfast, and followed by fresh croissants. I chose the Western breakfast of bacon and scrambled eggs. 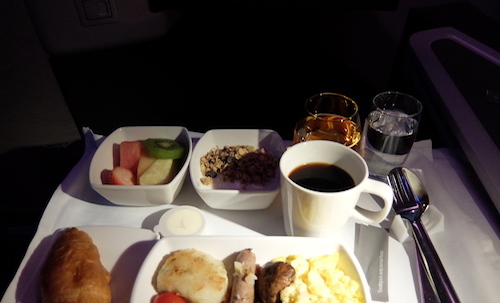 Despite being at the tail end of a long haul flight, the meal was tasty and fresh, which was a very welcome at this point of international travel.